North American Boxing Federation super bantamweight champion Bernabe Concepcion moved closer to a title shot against IBF champion Steve “The Canadian Kid Molitor with a smashing second round TKO in a title defense against 2004 US Olympic alternate Torrence Daniels in Queretaro, Mexico, Sunday morning (Manila Time). 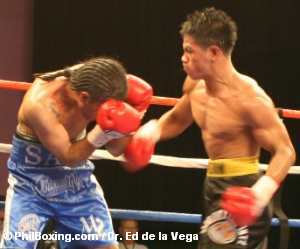 However, the 20 year old Concepcion, who is managed by former boxer Aljoe Jaro and is ranked No. 7 by the WBC and No. 9 by the IBF, proved far too strong and scored what ringside journalists referred as “an impressive second round TKO” at 2:42 of the second round. Jake Donovan of Boxing Scene reported that after a comparatively slow first round things “dramatically picked up-and ended-in the second. Concepcion himself told us in an overseas telephone conversation before the fight that Daniels was a good amateur boxer who had “speed but no real punching power” while Arum said that “sometime before the end of next year” he was planning to get Concepcion a title fight which is likely to be against IBF champion Steve “The Canadian Kid” Molitor. Concepcion who has a record of 24-0-1 with 13 knockouts has been training at the Wild Card Gym of Freddie Roach and has sparred with a roster of tough Mexican fighters. Concepcion aimed to put on a good show before Mexican fans in the opening pay-per-view bout. According to WBC president Don Jose Sulaiman, Mexican fight fans have been impressed by the 20 year old Filipino.